Surgery has been the traditional and hence most common treatment of Dupuytren’s disease. Surgery is usually considered when fingers are sufficiently contracted to interfere with lifestyle or work. Although surgery can usually help to straighten bent fingers, it cannot eradicate the disease, so problems with contraction can recur in other parts of the hand or fingers. The British Society for the Surgery of the Hand provides an information leaflet on the types of surgical options to be considered. The British Dupuytren’s Society and Prof Tim Davis produced a webinar on surgery, with several other eminent Dupuytren’s treatment providers speaking as well. It can be found on YouTube. Surgery is an effective and widely used treatment for Dupuytren’s contracture, although all surgery carries some risks. Non-surgical treatment options may include physiotherapy and massage, radiation therapy, which may prevent or delay the need for surgery, and a medicine called Collagenase Clostridium Histolyticum (Xiapex Injection). In general, the more extensive your surgery, the longer your recovery time and the higher the risk of complications. Discuss these issues and any aftercare procedures with your specialist before surgery. A relatively new concept in Dupuytren’s treatments is ‘One Stop Wide Awake’ (OSWA) treatment, where the patients gets only a local anaesthetic, no tourniquet, and can walk out of the hospital within hours of the initial appointment. A lot of hospitals still use general or regional anaesthetics (eg numb the whole arm). In OSWA the patient gets to choose date and time of appointment, and can have open fasciotomy or partial fasciectomy done the same day as their first appointment in most cases. There are two types of fasciotomy. An open fasciotomy is sometimes used to treat more severe cases of Dupuytren’s contracture. The procedure is more effective in the long-term than a needle fasciotomy, but it is also a more extensive operation and carries some additional risks because of this. See Surgery risks (below). Like a needle fasciotomy, an open fasciotomy will be performed as an outpatient procedure under local anaesthetic. The surgeon will make an incision (cut) in the skin of your hand so that they can gain access to the connective tissue underneath. They then cut the thickened connective tissue to divide it up and enable you to straighten your fingers. 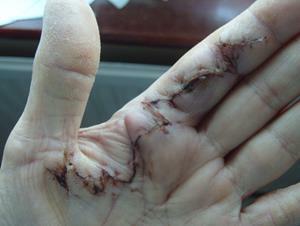 After the surgery, the cut on your hand will be sealed with stitches, and a dressing will be applied. The recovery time will be slightly longer than in a needle fasciotomy because the wound will need time to heal. Following the procedure, you may need to make another appointment to have your stitches removed, and you may be left with a scar. This is not commonly performed in Britain. partial (selective) fasciectomy – only the affected connective tissue is removed. complete fasciectomy – all of the connective tissue is removed. dermofasciectomy – all of the connective tissue is removed and the wound is sealed with a skin graft (where healthy skin is removed from another part of your body and attached to the wound on your hand). A partial fasciectomy is usually performed as the first operation. The surgeon is likely to make a characteristic zigzag incision over the affected area, so they have good access and the wound can contract a bit after healing without the scar becoming too tight. A complete (total) fasciectomy can be performed if the condition has recurred after partial fasciectomy, if you are very young when Dupuytren’s contracture first appears, or if your condition is very severe. Most surgeons will prefer to do a dermo fasciectomy in these cases, as removing all the fascia can cause extra problems with hand function. A dermo fasciectomy will usually be carried out under general anaesthetic (when you are unconscious and cannot feel pain), or regional anaesthetic (a local anaesthetic is injected around your nerves so that you cannot feel pain but you remain conscious). During the procedure, an incision (cut) will be made in your hand, and the affected connective tissue will be removed. If you are having dermo fasciectomy, you will also have a skin graft. During a skin graft, your surgeon replaces the skin that has been removed with skin taken from another part of your body. This will be from an area that is usually concealed by clothing, such as your upper arm, the front side of your elbow, or your groin. The healthy skin will be grafted (reconnected) onto your hand. As a fasciectomy is a more extensive operation than a fasciotomy, the risk of complication is slightly higher at around 5% (see Surgery risks, below). However, the more extensive the surgery, the longer the results last. For example, the rate of recurrence of Dupuytren’s contracture following dermofasciectomy is about 8%. The more extensive your surgery, the more likely you are to have complications. For needle fasciotomy, the rate of complications could be as low as 1%. For fasciectomy, studies have found complication rates to be higher, from around 5%. Some possible complications are listed below. Splitting the skin with the needle during needle fasciotomy. Damage to the nerves that supply sensation to your fingertips. Although they can be repaired, there is never full recovery of sensation. 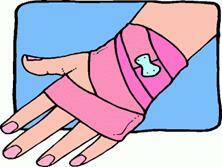 Joint stiffness – this can be helped with hand therapy (see Dupytren’s contracture – after surgery). Wound failure – if the wound heals or the graft fails. This is more likely if you smoke. Infection of the wound, which is usually treated with antibiotics. Haematoma – a swelling that is filled with blood, which forms as the wound heals, usually in the palm. This can be drained to reduce it. Scarring – depending on how large the incision (cut) required for the surgery was, you may be left with a scar. Complex regional pain syndrome – a rare complication that causes the hand to become painful, stiff and swollen after surgery. It usually resolves itself within a few months, but there can be permanent problems. Finger loss – although this is very unlikely. As with all surgery the skill and experience of the surgeon is important and this appears to be so with Dupuytren’s. We recommend discussing in detail with your surgeon the nature of the operation including the post-operative condition and treatment. If possible talk to other patients that your surgeon has operated on. Our treatment links page list some UK surgeons who have experience treating Dupuytren’s. See this personal report by one person for their view on how important it is to choose an experienced surgeon.